The Logitech G Pro gaming mouse is designed to be a smaller form fitting ambidextrous mouse. What this means is that the Logitech G Pro is designed to comfortably fit any hand, left or right, but is designed with those who have smaller hands in mind. The Logitech G Pro is suitable for finger grip or claw grip usage styles. I found that the Logitech G Pro has a good design structure and sophisticated feel, with smooth sleek exterior it emanates a sense of luxury that is intoxicating for any gamer looking to improve their experience. The Logitech G Pro was designed with the success and help of two prominent e-sports athletes. So you can imagine that the ultimate aim of the Logitech G Pro is to achieve great things in a competitive setting and to grant gamers a serious competitive advantage. The Logitech G also feels durable and well made in one’s hand. Size wise the Logitech G Pro weighs in at 4.6 ounces with a length of 1.5 inches, a width of 7.56 inches and height of 4.59 inches. 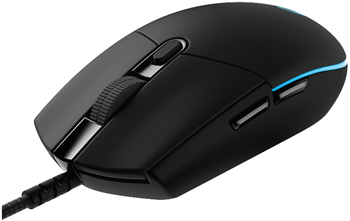 The Logitech G Pro gaming mouse makes use of the very sophisticated and advanced PMW3366 optical gaming sensor. This sensor boats exceptional tracking at any control pace or hand speed. This is so that the sensor provides an excellent and pixel precise targeting for high-speed maneuvers across the entire range of DPI, which in this case is a snail’s pace of 200 to lightning fast 12,000. This amazing PMW3366 optical gaming sensor which has become a standard aspect of all the superior Logitech gaming mice means that there will be zero smoothing or filtering across the entire DPI range. In short the PMW3366 optical gaming sensor delivers an exceptionally accurate and consistent responses at any speed and on most surfaces. The physical design of the Logitech G Pro is that of a durable long lasting gaming technology, with an advanced sensor it is certainly useable for a good while. The superior advanced button tensioning on the good sized left and right mouse buttons means that gamers will experience crisp and reliable clicking performance at a very high level, suitable for competitive settings. The tensioning reduces the need for force and responds very well to simple touches. There are also six programmable buttons which may be set to store one trigger commands for optimal advantage in your favorite games. As one expects at this level of serious gaming mouse there is an included software package which enables customization of the macro buttons which is stored in on board memory. The lighting of the side panel and the insignia is also fully customizable with a whopping 16.8 million colors. This could be used to style to your setup or show off your team colors. 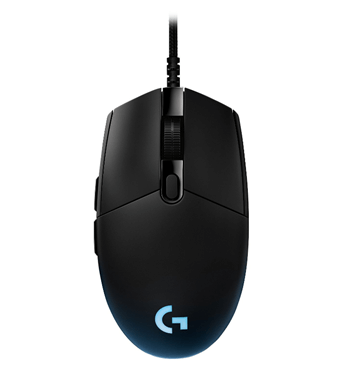 The Logitech G Pro gaming mouse can store up to five profiles for different button and color configurations, allowing you to adopt your macro settings to whichever competitive setting you find yourself in. My overall experience with the Logitech G Pro gaming mouse is that it is well designed to fit most hand types and most grip styles. The smooth sleek finish fits into any gaming rig setup and looks good when not being used. However when being used the Logitech G Pro’s advanced optical sensor outperforms and is as always an excellent addition to the gaming mouse and the experience that gamers have when using Logitech devices. The operation was smooth and extremely accurate and reliable during my extensive gaming session. I would highly recommend this gaming mouse to any serious gamer looking to up their game with a professional e-sports gaming mouse. Reliable brand with a strong research and development base.